George Bush is a man of faith--and the Lord has called him to deliver a message to another man who has the power to begin the process of restoring world peace. Will President Bush rise to the occasion? The conflict between Jew, Christian, and Muslim cannot be resolved with guns and bombs. The only solution is spiritual--and there is only one man who can at present begin the process of world-healing. 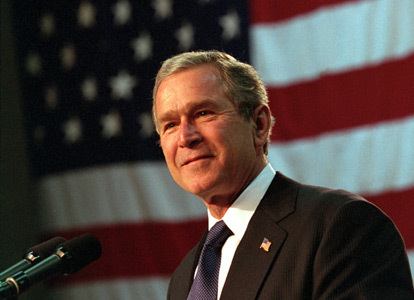 Will you write to President Bush and encourage him to perform the task that God has called him to do? George Bush is a man of faith - the Lord has called him to deliver a message to one who has the power to begin the process of restoring World Peace. The conflict between Jew, Christian and Muslim cannot be resolved with guns and bombs. The only solution is spiritual, and only one man can begin the process of world-healing. Will Pres. Bush perform the task that God has called him to do?